Miami Gardens, FL. (Mar. 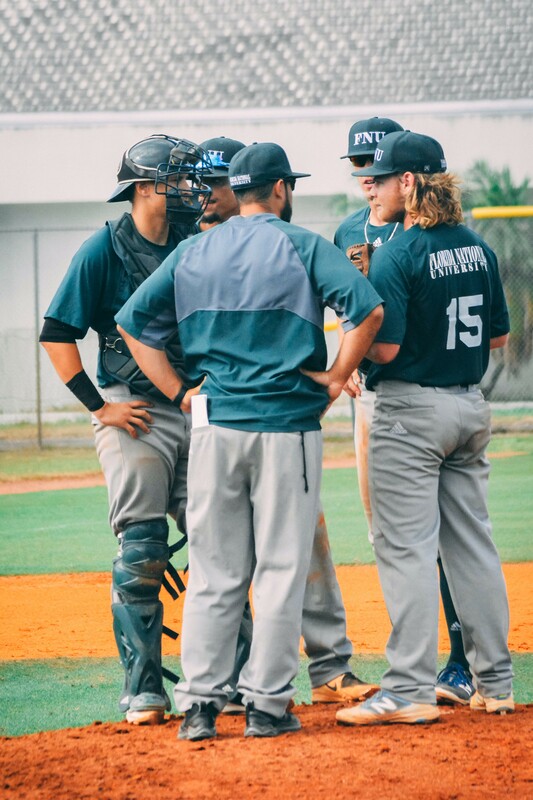 6, 2018) – The Conquistadors struggled against the Lions of Florida Memorial University, final score Lions 14 Conquistadors 1. Memorial 2nd, Marruffo, E walked, RBI (3-0 BBBB); Gomez, an advanced to second; Clara, C advanced to third; Perry, J scored 0-1. Memorial 2nd, Gomez, V walked, RBI (3-2 KBFBBB); Marruffo, E advanced to second; Gomez, an advanced to third; Clara, C scored, unearned 0-2. Memorial 2nd, Hernandez, a hit by pitch, RBI (0-0); Giodarno, M advanced to second; Marruffo, E advanced to third; Gomez, A scored 0-3. Memorial 2nd, Guerrero, R grounded out to 2b, RBI (1-2 BKSFF); Hernandez, an advanced to second; Giodarno, M advanced to third; Marruffo, E scored 0-4. Memorial 2nd, Chil, S doubled down the lf line, 2 RBI (2-2 BBKF); Delgado, P scored; Hernandez, A scored 0-6. Memorial 2nd, Perry, J singled to center field, RBI (3-1 FBBB); Chil, S scored 0-7. Memorial 3rd, Gomez, V flew out to cf, SF, RBI (0-0); Gomez, A scored 0-8. Memorial 5th, Delgado, P walked, RBI (3-2 BBFFFBB); Guerrero, R advanced to second; Hernandez, an advanced to third; Vargas, A scored 0-9. Memorial 5th, Giodarno, M singled to center field, RBI (1-1 SB); Meija, R advanced to second; Guzman, J scored 0-10. Memorial 5th, Garcia, R reached on an error by 3b, advanced to second, 2 RBI (0-2 KF); Clara, C advanced to third; Giodarno, M scored; Meija, R scored 0-11. Memorial 5th, Vargas, a single to left center, 2 RBI (2-0 BB); Garcia, R scored, unearned; Clara, C scored 0-14. National 7th, Bravo, L singled to left field, RBI (2-1 FBB); Braafhart, Z scored 1-14.